The first mosaics were created in Mesopotamia thousands of years ago. Terra Cotta cones embedded in the walls and columns of buildings in Mesopotamia are the first know examples of mosaic art. These colored cones were laid in geometric patterns and were functional, by adding strength the structure, as well as decorative. In the Byzantine era, the 5th - 15th centuries, mosaic art was embraced and perfected by the Romans. During this time mosaics were created to cover entire walls and ceilings and important artist designed mosaics for the great cathedrals, including St. Peter's Basilica. 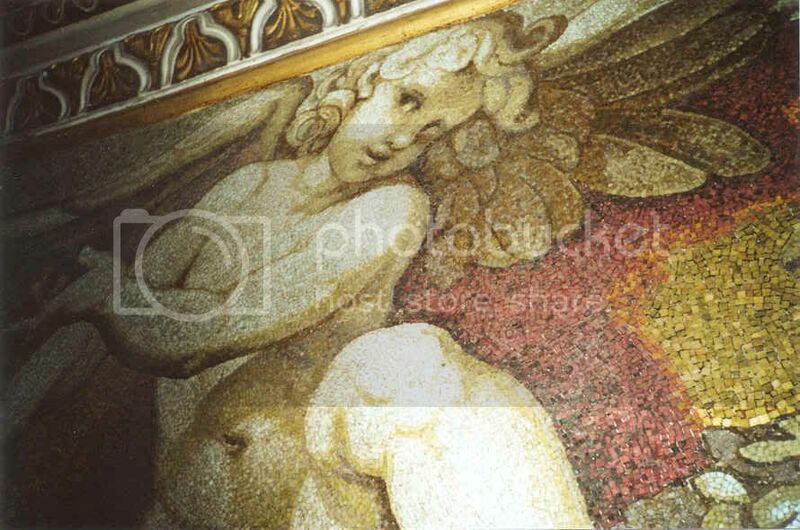 The Art Nouveau movement of the 19th century brought further change to mosaic art. 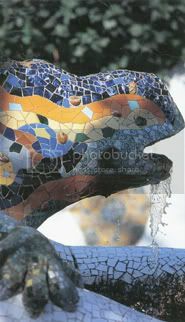 Artists, such as Spanish artist Antonio Gaudi, began creating works with free-form curves encrusted with fanciful, brightly colored tiles. 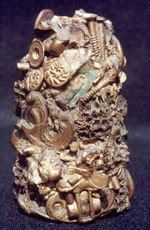 American women in the early 20th century began a tradition of covering vessels with everyday items and souvenirs such as jewelry, buttons and figurines. These vessels, called "memory jugs", were then gilded or bronzed. Memory jugs forever preserved the most beloved items and often carried great sentimental value and family memories. In France, the practice of using personal objects as part of mosaic art was extended beyond vessels to furniture. It was during this time that the name "Pique Assiette" was first used to describe the mosaic art form. The inspiration for the name was a French man by the name of Raymond Isidore who, in 1938, began covering his home with bits of pottery, china and colored glass. 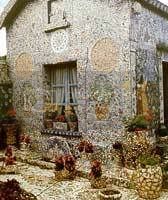 Isidore devoted the rest of his life to the art eventually covering every inch of this house and furniture with mosaics. His neighbors, who were less than thrilled, began to mockingly refer to Isidore as "picassiette" which in French describes someone who is a "scrounger" or "sponger", as in stealing food from other people's plate. His home is now a national treasure in France. In Los Angeles, CA Simon Rodia (1879-1965) spent 33 years of his life building a series of towers out of concrete and steel over 100 feet tall in his backyard. 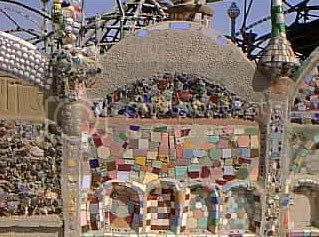 Rodia covered these towers with fragments of glass, tiles seashells and other found objects. Know today as the Watts Towers they have been deemed a cultural landmark. 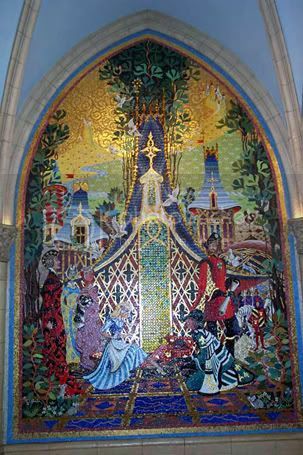 In Cinderella's Castle located at Walt Disney World's Magic Kingdom in Orlando Florida you will find beautiful examples of mosaic wall mural panel art. 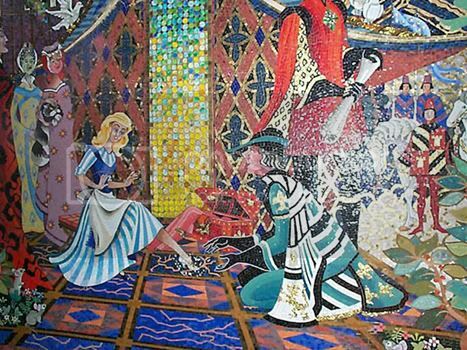 These large 15 x 10 foot murals, 5 in all, depict scenes from the classic story "Cinderella". Each panel was designed by Disney artist, Dorothea Redmond and converted to Italian colored glass mosaic pieces by mosaicist Hanns-Joachin Scarff.